Stunning, yet simple are the words that come to mind when I remember this quilt made by Katrina in Carolyn Friedlander's Gleaned fabrics. She suggested pebble quilting, and I absolutely concurred. I ordered the exact tone of brown thread to blend with the negative space. The results are deliciously earthy and textured. What a beauty! 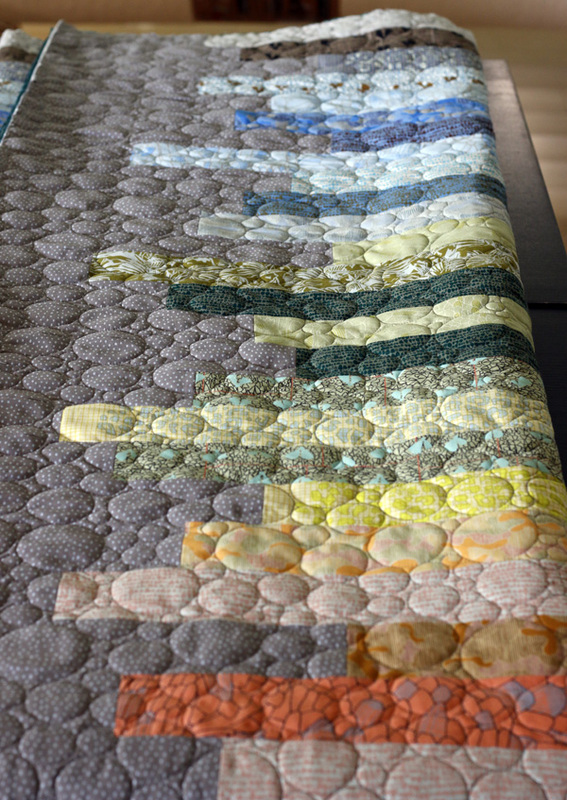 Far from earthy, this quilt is happy-go-scrappy (quilt pattern by Sandra Clemons). I love when people use a classic polka dot in lieu of solid white. It gives the quilt such a playful vibe. Even a bit of a vintage flare, don't you think? I suggested Clamshell Fan quilting for this one. The rounded shapes contrast nicely with all those little squares. I used a golden yellow thread for extra cheer. This month I accepted a few rush orders. Wondering how that works? Well, I schedule all quilt orders on a calendar, assigning myself 3-4 per week depending upon their size. This allows me to communicate clearly with my customers about timing and make sure I don't get overwhelmed. If I accept a rush order, it won't push back my current commitments. Instead, I'll have to work more than I was planning to add an additional quilt to an already-full week, rather than putting it at the end of the line where new orders would normally go. I charge a rush fee of at least $50 for this service. It's like working overtime! I expect I'll be asked to do a fair number of rush orders near the holidays, so I figured I'd best come up with a plan. This quilt was a rush baby gift. The sweet little thing by Charla O. might be my favorite purple quilt yet. I think the Cloud Stagger quilting adds just the right dreamy dimension to these fairytale swans. Added bonus - clouds keep a quilt soft and cuddly. Last night I finished another rush order. It's an other gift, this time destined for a friend in Europe. So glad I could help Linda finish it in time to carry with her on a flight this July. This pretty quilt is made of Kaffe Fasset stripes. I'm in love with the color palette. Of the two choices I proferred, the customer selected Sparkle quilting. This was my first time quilting Sparkle and I LOVE how it turned out. Depending on how you look at it you'll see pointed little sparkle-squares or curvy waves. Mmm... quilting texture. This one is perfectly delightful! Right now I am accepting regular quilting orders for service the week of August 6th. I keep this information updated at the top of this Order Quilting page. If you ever do find yourself in need of rush service, please contact me prior to ordering to ensure I am able to meet your deadline. Thanks for considering Stitched in Color quilting services!